At first glance, a romantic ride in a rowboat might seem like a pleasant activity for lovers. 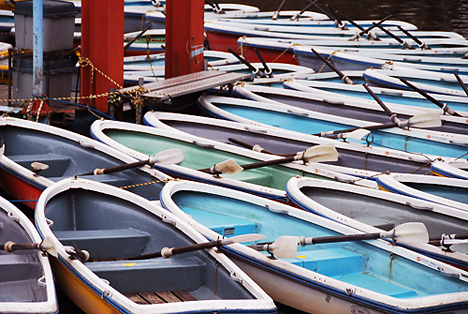 Lakes and ponds across Japan commonly offer boats for rent, making them popular spots for couples on a date. But beware: these ponds are often dogged by superstitions claiming that couples who venture out in the boats are doomed to break up after they return to shore. One of the most notorious relationship-wrecking boat ponds is at Inokashira Park in western Tokyo. The pond is located next to a small shrine dedicated to Benzaiten, the goddess of all things that flow (including water, speech, music and money). According to local legend, the goddess has a vengeful jealous streak that compels her to split up the happy couples in the rowboats. However, it is said that Benzaiten spares those who pay a visit to the nearby shrine after their boat ride. Another boat pond known for jinxing relationships is at Higashiyama Park in Nagoya. The superstition at this park appears to be linked to an old legend involving a dragon living in the pond. According to the old story, the dragon was able to fly high into the sky to fetch magical water that could wipe away a person's sad memories. The story has evidently mutated over time, and the water that once enabled people to forget their sadness now causes people to forget their relationships. Interestingly, the park has tried to make hay of the superstition by offering free boat rentals to courageous couples in February during the Valentine's season. Similar superstitions haunt boat ponds nationwide, including Nakajima Park in Sapporo, Shinobazu Pond in Tokyo, Shakujii Park in Tokyo, Omiya Park in Saitama, Lake Senba in Mito, Maruyama Park in Kyoto, Takaraga-ike Park in Kyoto, Arashiyama near Kyoto, the pond at Okayama Castle (the swan boats), Tokiwa Park in Ube, Takinomiya Park in Niihama, and Ohori Park in Fukuoka (only dangerous if you pass under the bridge). Undoubtedly there are others. Although these superstitious claims are not supported by evidence, they are enough to make some people think twice before jumping into a rowboat with their sweetheart. I love this urban legend, but why are only the boats dangerous which lie behind the bridge in ohori park? I heard that any couple visiting Inokashira park is doomed, especially new couples. This would seem to make it impossible for anyone to get a break in the rowboat industry. Are these municipally funded operations? Can't wait for the next episode of this urban legends series!